I recently leased a vehicle at this dealership. The car looks beautiful and I got a great deal. My salesperson ( Jason Chen) made me feel welcomed and did not pressure or rush me on my decision (I was there a while deciding). I definitely would recommend coming here if you're looking to get a new MB. Jeffrey Stampler is an excellent sales person for your dealership. He is very attentive to detail and made the experience enjoyable. After I left the lot with the new car I contacted Jeffrey for some assistance with the controls which are advanced when compared the my last leased SUV. He has been very helpful. I met a few dealers before I came to HB. Jason’s honest and professional attitude was very impressive to me, and also introduced me knowledge regarding my car models. That’s why I chose HB to get my car. Jason is definitely a perfect sales representative to a product or a company. I recently purchased a preowned vehicle. My entire experience was outstanding. Dealership was clean and everyone was exceptionally friendly and helpful. 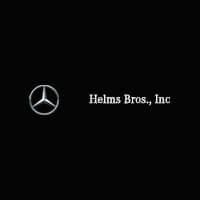 I’m very happy with Helms Bros and will recommend this dealership to all my friends and family. The service at this dealership is excellent. Andrew Han, a sales associate, was able to answer all of my questions and assisted me with any information about the car I was looking to purchase. Ms. Lang, the sales manager, made sure that I was going to get a car that I was happy with. Her first priority was making sure that I got the car I was looking for and that I was happy with my purchase. I would highly recommend anyone who is looking for a new Mercedes to visit this dealership.